Venice has held a festival on this day every year since 1681 to give thanks to Santa Maria della Salute for delivering the city from the plague. A terrible epidemic hit Venice in 1630 during the war against Austria and in just 15 months 46,000 people died from the disease. 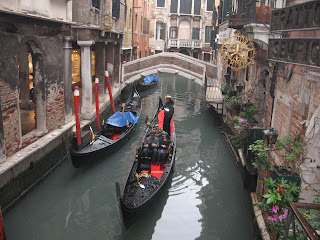 The epidemic was so bad that all the gondolas were painted black as a sign of mourning and they have remained like that ever since. The Doge had called for people to pray to the Madonna to release the city from the grip of the plague and had vowed to dedicate a church to her if their prayers were answered. 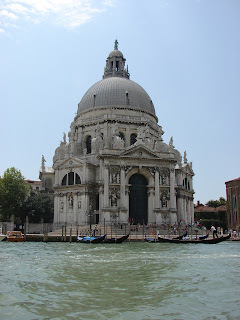 When the plague ceased, in order to thank the Virgin Mary, the Senate commissioned Baldassare Longhena to design Santa Maria della Salute, a splendid baroque church on Punta della Dogana, a narrow finger of land between the Grand Canal and the Giudecca Canal. Construction of the magnificent church began in 1631 and took 50 years to complete. On the occasion of the inauguration in 1681, a bridge of galleys and ships was formed across the Grand Canal to allow a mass procession of the faithful to the Church. It was decided that the Senate would visit the church each year on November 21, the date of the feast of the presentation of the Virgin in the Catholic calendar. 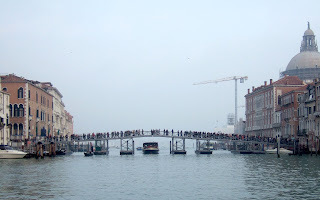 For the Festa of Madonna della Salute, the city’s officials parade from San Marco to Santa Maria della Salute for a service over a temporary pontoon bridge formed across the Grand Canal. The solemn procession crosses it to reach the Church, where in the presence of the icon of the Virgin, thousands of votive candles are lit. The candles are sold to the local people by stalls surrounding the Campo della Salute, along with balloons, cakes, sweets and hot food to contribute to the festive fun. Several thousand Venetians will make the pilgrimage across the temporary bridge today to light a candle to thank the Virgin Mary and pray to her for continued good health. On the day of the festa it is also traditional for Venetians to eat a special soup known as Castradina, which is made from cabbage, dried spiced mutton and rosemary. 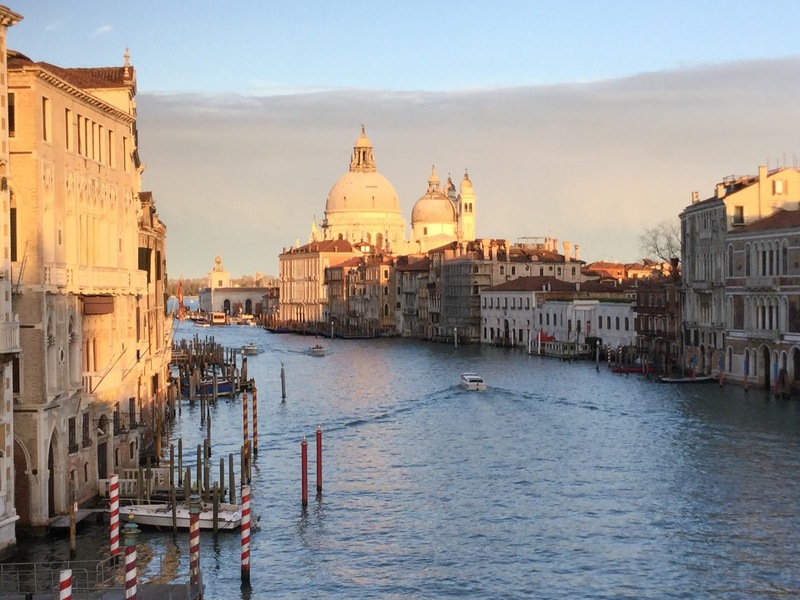 The great baroque church of Santa Maria della Salute standing at the entrance to the Grand Canal is supported by more than a million timber piles. It is one of the most imposing architectural landmarks in Venice and has inspired painters such as Canaletto, Turner and Guardi. The interior consists of a large octagonal space below a cupola with eight side chapels. There are paintings by Titian and Tintoretto and a group of statues depicting the Virgin and Child expelling the plague by the Flemish sculptor, Josse de Corte.